As I’ve mentioned on this blog many a time Wolf Trap is my favorite concert venue in my surrounding area, so even though it’s a bit of a trek I try to get there at least once a summer. In looking at the schedule for this year I settled on seeing The Band Perry. My original date wound up having to travel for work and it seemed all my other country music loving friends, who don’t number that many, were heading out early for the long weekend, so much to my husband’s dismay he became my date. The opening act was someone named Lindsey Ell, whom I had never heard of before. She wasn’t awful, but I can’t say that she was really great either. She was definitely trying very hard, and I can see her one day being a great performer. She’s just not quite there yet. She doesn’t have enough of her own music to be quite ready for prime time yet either. Not even just as an opening act in my opinion. Probably close to half of her set was covers, and nothing I was particularly interested in. I didn’t mind the stuff of her own that she was singing though. I think it was a little too early for her to be out on tour as the only opening act at this point. If had been one of those shows where there were two openers with the first doing a quick 30 minute set I think she would have been great. She just didn’t have enough to fill out 45 minutes. I’m sure she’ll get better as she gets some more material together though. The Band Perry’s set was fun and they are very high energy. It was very different than what I’ve been used to seeing lately though. I can’t recall the last time I saw a concert that was this produced and choreographed. I don’t tend to go see the kinds of artists who put together elaborate sets. Usually it’s just people up on the stage with their instruments and if you’re lucky they’ll do something interesting with the lighting. I actually prefer the latter a little bit more because I’m in it for the music, and it feels more organic to me. Last night you could tell that they say the same thing every night just substituting out the location in what they’re saying. No surprises there. It was definitely visually interesting, and a well produced show, but I prefer my concerts to feel a little less like they came out of a box. I know some people prefer this kind of spectacle though, so to each his own. That being said I did enjoy the show, and The Band Perry really does have fun on stage. In my opinion they’re at the perfect point in their career to be headlining a show. With only two albums under their belt they’re pretty much guaranteed to play every song you want to hear whether it was a hit single or some other track off the albums plus still have a little room left over to play around with a cover song or something. That was definitely the case last night. I got to hear every song I wanted them to play and they also had time to sing some covers. They really got the crowd going with a cover of Queen’s “Fat Bottomed Girls”. They also sang a modern version of “Amazing Grace” from which they went directly into a cover of Pitbull and Ke$ha’s “Timber” because obviously. It was a fun show, and I would definitely see them again on a future tour. I shall leave you with my current favorite song of theirs “Don’t Let Me Be Lonely”. Sadly I didn’t get to enjoy it that much last night because I went to the bathroom the song before and spent most of this song trying to figure out where the heck I left my husband in the sea of people on the lawn in the dark. Yesterday I helped host a bridal shower for my friend Darra who is getting married next month. She is a francophile and loves wine so we decided to have a French themed shower and have the activity be a wine tasting. 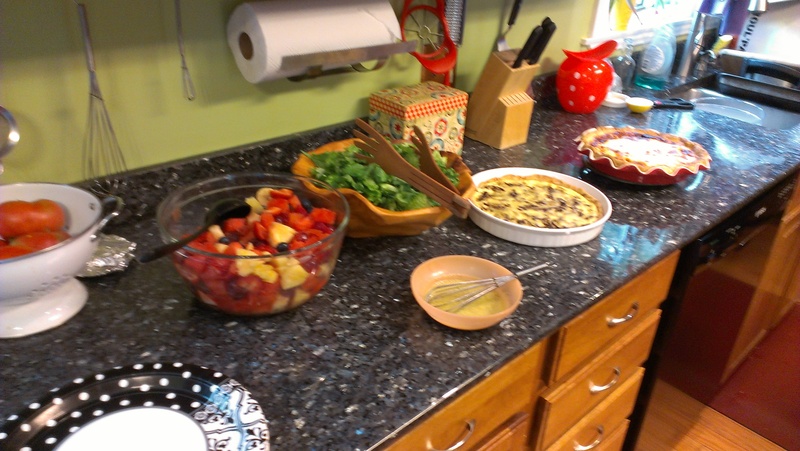 Most of the food was French aside from the cake. We had bread, cheese, and crackers as appetizers. Lunch was a Julia Child simple French salad recipe, potatoes Anna, a caramelized onion tart, a quiche Lorraine, green beans Provencale, and petit fours. 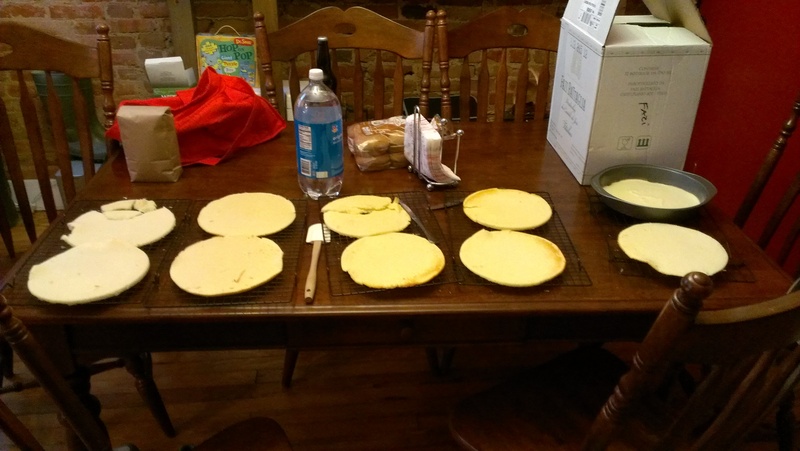 In addition to all the French food I decided I was going to make a Smith Island Cake. 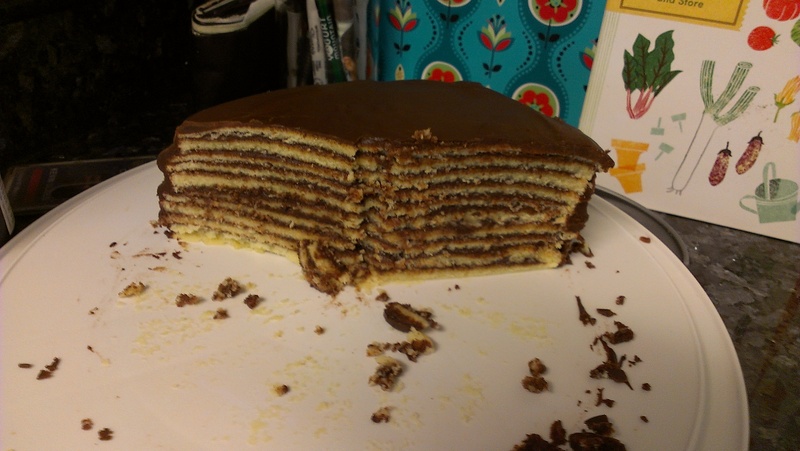 For anyone not from Maryland, it’s the official Maryland State dessert and essentially is a cake with a bunch of layers usually in the 10-12 layer range. 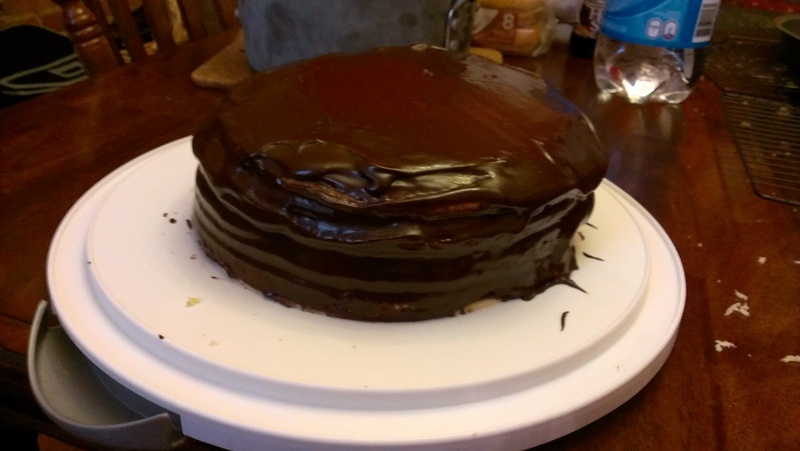 The original recipe is a dense yellow cake with a fudgy chocolate frosting. I have seen them made in any number of flavors though. Back 6 or 7 years ago when the Maryland legislature was stupidly spending time debating whether this cake should be our state dessert I decided I was going to host a dinner party and make a Smith Island cake for it. After making it and seeing how much time it took I vowed to never make one again. Darra was always bugging me to make another one, and at one point when she was looking for a house she was never going to buy I told her I would make her a cake when she bought a house knowing I would never have to fulfill that promise. I decided that her getting married was equally if not more momentous than buying a house though and deserved the time and effort of me making the cake. And I am once again reminded why I never want to bake this cake again. It probably took me about 4 hours from start to finish given baking all the little layers and the frosting that takes awhile to cook up. After lunch we had a blind wine tasting. I picked out 3 bottles each of a pinot grigio/gris and a cabernet sauvignon: one from Maryland, one from California, and one from France. Interestingly in the blind tasting almost everyone wound up liking the two Maryland wines better than any of the other ones. We were all kind of shocked and decided we needed to stop putting down Maryland wines. Then of course it was time for presents. Darra didn’t put a whole lot on her wedding registry, which I understand. When you get married later in life you already have all the stuff that usually gets put on registries and at that point you both usually have a set so you actually need to get rid of stuff not get more of it. She also already had a shower in Pittsburgh where she is from, so everything was pretty much already gone by the time this shower rolled around. I don’t mind giving money or gift cards at the actual wedding, but I think it’s better for a shower to have an actual gift. I was trying to come up with a good gift idea for something that wasn’t on her registry. One of the things that I loved that someone gave me when I got married that I wasn’t registered for is a vase that has an engraving of our wedding invitation on it. 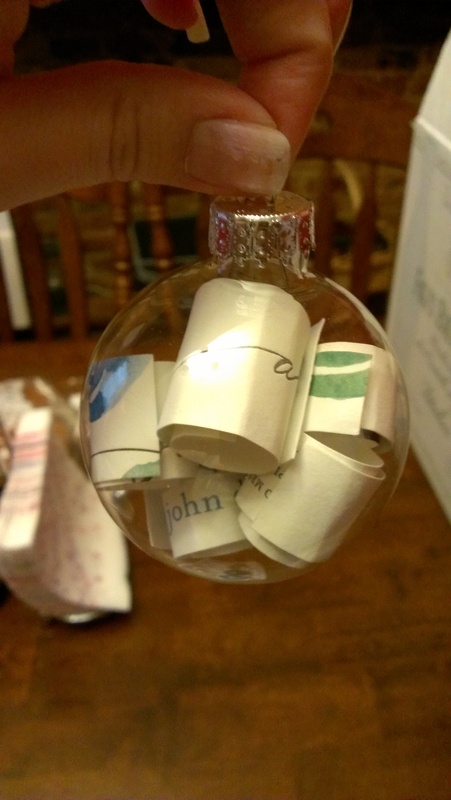 I was trying to figure this gift out far too late to get something like that done, but it got me started googling for wedding invitation keepsakes and I found this idea for making a Christmas ornament out of the invitation. 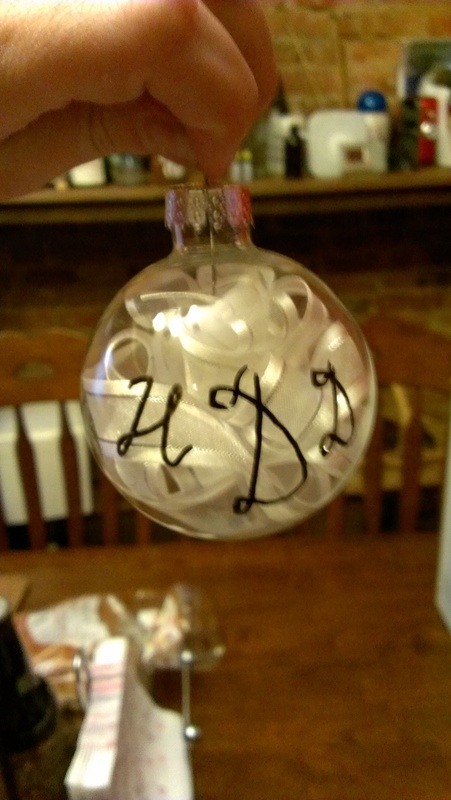 I am not a very crafty person, but this looked like something even I could pull off. 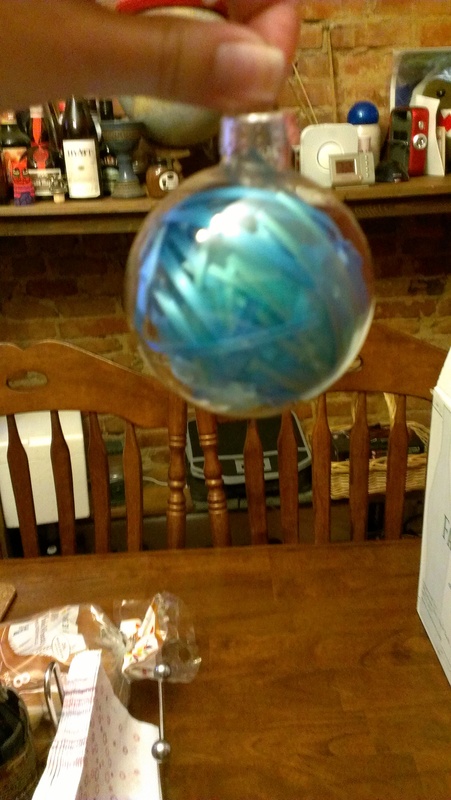 Then of course I had to decide what to do with the other 5 ornaments in the box. Anything I wrote on is not very professional looking, but I think they turned out well. I have one more to actually give to her after the wedding. 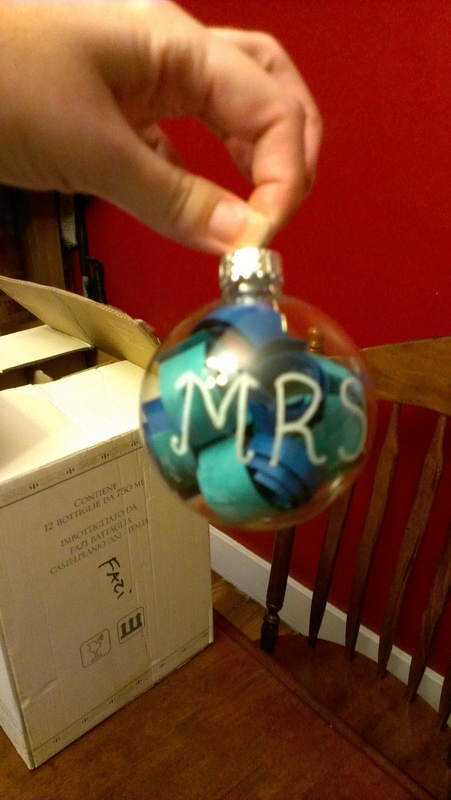 I saved one of the ornaments to put some dried flower petals from the wedding bouquets in, which is another idea I saw online. 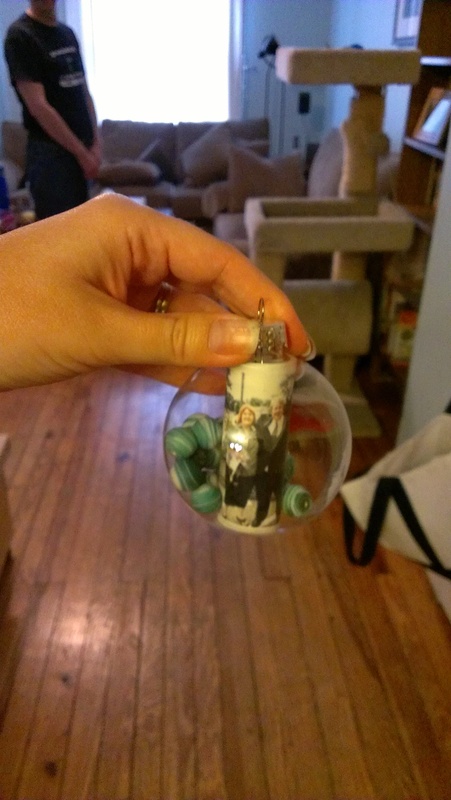 It works that I was planning on saving back an ornament do that anyway, since I did manage to break one while putting these together. I’ll just get a replacement to use after the wedding so she can have a complete set of 6 until she breaks one. I’m pretty pleased with how they came out, and I think she really liked them. It was a fun day, and I’m looking forward to the wedding in a few more weeks. Since dealing with copyright issues is part of my job I was curious about the recent MOOC on Copyright for Educators and Librarians. If you are not familiar with MOOCs the acronym stands for Massive Open Online Courses. They’re the new trendy thing in higher education. I have my doubts, but that is not for this blog post. Professors teach online courses to large numbers of people for free is essentially the gist of it. There are a couple of different sites for MOOCs including EdX, Udacity, and Coursera, which was used for this course. This particular course was produced at Duke and taught by 3 instructors, one from Duke, one from UNC, and one from Emory. MOOCs can have enrollments in the 10s of thousands. This one had about 8,000 to start. Statistics show that completion rates of MOOCs are pitifully small, so I would be curious to know how many people actually completed this one. Back before the program got eliminated I also completed an online certificate in copyright management through the University of Maryland University College’s Center for Intellectual Property. I was curious to how my experiences learning online in a more traditionally sized course compared to a MOOC. The biggest difference was obviously the size. There is no way the professors could give personal attention to all the students in this course nor could they actually grade our written assignments. All we got in the way of feedback was an answer rubric that let us compare what we had written to what they thought we should have written. In both instances I felt like online learning was not as useful as in person learning. Both revolved a lot around discussion boards and it felt like people were just responding to the instructor’s questions and not so much each other so it wasn’t really much of a discussion. Maybe other instructors have found better ways to facilitate this, but so far my experiences have been poor. It’s nothing like having an in-class discussion on a topic where people are really engaging it. In the MOOC it was also impossible to keep up with all the posts because there were a ridiculous amount of them. The software running this course was also pitiful in regards to the discussions of this scale. The box to add your input to the discussion was at the bottom of the thread which could be hundreds of posts long so you had to scroll forever to get there if you weren’t one of the first people to respond. Second if you actually did start having an actual conversation with someone you could never realistically go back and see if they responded to you. Good luck ever finding that particular post again, and there was no way to subscribe to just a single post conversation without subscribing to the entire discussion thread. I accidentally did that once and my email inbox was flooded in minutes until I got back in and shut it off. Though most of the content for me was stuff I already knew, I did pick up a few things especially around international copyright law which I’m not very familiar with. It was also good reinforcement that I do know what I’m talking about, which is definitely good since I’m trying to educate others about copyright. I did find the topic order a little haphazard and not the order I generally see copyright information presented. It made me wonder if people who were coming into this cold or with very little knowledge of copyright law were able to follow along as well as I did. I do know that one of my friends who also took this course was confused by where they got some of the answers because she didn’t know the case law they were pulling from and they didn’t specifically note it in the example answer. I certainly appreciate that something like this course exists, and hope they do run it again in the future. I think it’s a good first step for people interested in copyright. I’m glad I participated and got to experience what learning through a MOOC is like. I can see MOOCs being useful for people wanting to get a baseline amount of information or a refresher on a topic, but I in no way think they substitute for more traditional courses whether online or face-to-face. The newly remodeled and expanded historic Senator Theatre in Baltimore has been showing old movies on their big screen on Wednesday nights. 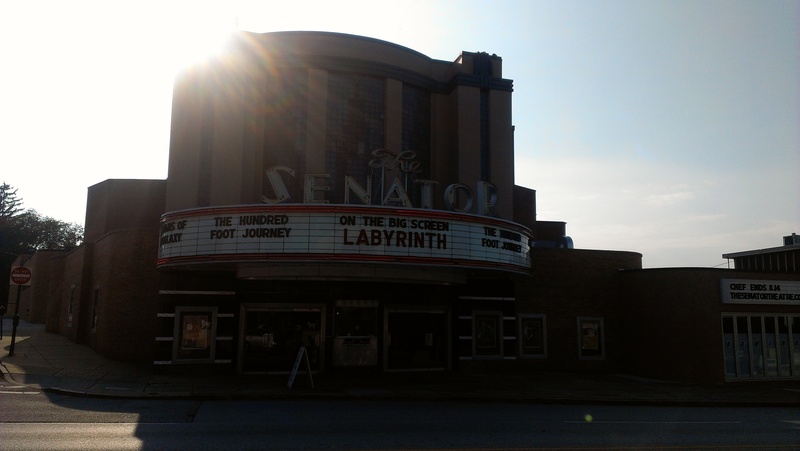 Last night’s movie was Labyrinth. It’s one of my favorite childhood movies, so despite the fact that I own a copy of it I wanted to go see it in an actual movie theatre. I apparently was not the only one because that theatre holds 900 people and it was at least 80% full. I was kind of surprised by the number of people there, but I guess I shouldn’t have been. I love the movie, so it should be no surprise that others do too and also wanted to see it. The big screen definitely reveals the primitive special effects compared to today’s, but it was still fun to watch. There was of course much giggling every time we got a nice shot of David Bowie’s, um let’s say amply showcased package. I’m going to have “Magic Dance” stuck in my head for days. Prior to the movie Paul and I finally had dinner at Shoo-fly Diner for real. We had yet to eat at the restaurant, though they catered the grand reopening of the Senator which we were at. I had heard middling things about it after it first opened, but I felt like recently I had finally heard some more positive reviews. I was hoping they were going to turn it around since Spike Gjerde’s other restaurants are so delicious. I’d say our first experience was a pretty positive one. It was a lovely evening so we got to sit outside on the patio. I had the fried chicken, which was tasty. It was a half chicken plus a piece of cornbread. I ordered a salad on the side. I wish that they instead had served a quarter chicken plus a vegetable and starch side as opposed to an entire half chicken, which I can’t eat. I’m sure some people prefer that much meat though. Paul had an eggplant dish which he said he enjoyed. I’ve heard people say good things about brunch, so we’ll have to try that next. I’m happy that it seems they’ve gotten some of their early kinks ironed out. While my husband has been off at Vegas since last Wednesday for a convention I wound up with a long weekend because my library was having a new boiler installed on the roof which involved bringing in a crane. For safety reasons we had to be closed, which meant I got a bonus day off work. I spent the afternoon with my friend Kristen. We had lunch at Barcocina. I had heard great things about how they had renovated the space since taking it over after Shuckers closed. The reviews online were middling though, so I was a little worried about how it would be. We had a nice lunch though. The weather was lovely so we got to sit out on the patio right along the water, which was great. The space definitely is the best thing about the restaurant. As the other reviews suggested the food was fine, but nothing outstanding. I had the buffalo chicken tacos, which although spicy did not really taste like buffalo sauce to me at all. My friend had the shrimp quesadillas, which seemed to have enjoyed. I feel like the service must have been a little lacking somehow as well. Because we were out to enjoy a nice leisurely, casual lunch and were enjoying catching up I didn’t really notice it while we were there, but when we left I realized we had been there at least an hour and half. Not exactly a speedy lunch and not great if you needed to get back to work. After lunch we stopped and got some gelato from Pitango Gelato. I love me some Pitango, but it had been a very long time since I had been. With the Charmery now open steps from my house I’m much less inclined to drive down to Fells Point for gelato. It was nice to pay them a visit again. The rest of Friday evening was spent dealing with taking my cats to the vet. One of them is sick and not eating. We still don’t know what’s wrong and that’s not a happy topic so I’m going to dwell on it here other than to say that we tried out a new vet, and I’ve really liked them a lot so far. So if you’re looking for a vet in Baltimore I would recommend Doc Side. Saturday I took myself to the movies to see Boyhood. It’s written and directed by Richard Linklater, who also did the Before Sunrise, Before Sunset, Before Midnight trilogy. I loved all of those movies and I was looking forward to seeing this one. In some respects it’s the same as those movies as it feels like dropping in on someone’s life and watching them for awhile. It’s about living in the small moments of a life. In the Before trilogy you’re seeing a few hours in a couples life play out almost in real time and dropping in on them every 9 years. In Boyhood you’re dropping in on a family every so often, but for much shorter periods of time but more frequently. It’s also actually a very interesting piece of filmmaking. If you know anything about the movie than you know it was filmed with the same actors over a period of 12 years with filming scenes with them every so often over that period. Ethan Hawke and Patricia Arquette play a divorced couple raising two children. Linklater’s daughter Lorelei played the daughter Samantha and Ellar Coltrane played her younger brother Mason Jr., who was the main focus of the movie. Because of watching the same people age over a number of years I had to stop and remind myself several times that this was a fictional movie and not a documentary. That of course also had to do with the story of the movie, which really did just feel like watching someone’s life unfold. At points it may have felt a little too real. It was really lovely though. I both laughed and cried while watching it, which is always the sign of a good movie. If it sounds like something you think you would enjoy I would definitely go see it. Saturday night my friends Sean and Catherine had a housewarming party, so I went over there for a few hours to welcome them to the neighborhood. They have a great little house, and I am jealous of their garage. I’m sure they’ll be happy there for many years. It’s nice to have more friends moving into the neighborhood for a change too instead of leaving it for the suburbs or another state entirely. After church this morning I went out to lunch and for ice cream with a couple of friends. All in all it’s been a nice weekend. Though I could do with out the cat drama. I’m also looking forward to having my husband back home tomorrow night though. It is obviously no secret that I love live music and music in general. My husband does not share my deep, abiding love for going to concerts. Over the past 10 years that we’ve been together I’ve forced him to go to countless concerts with me. Last night was the first time he has ever initiated us going to a concert. So who may you ask inspired him to want to go to a concert? Well if you read the subject of this than you probably already know, but it was Imelda May. She’s an Irish rockabilly singer. I had not been familiar with her prior to the concert, but I enjoyed her. She had a great energy, was great at talking to the crowd in a humorous way, and trying to get the crowd into the show. You know I always love a good cover song at a concert, and for the first song of her encore she came out on stage with just one of her band members who played the ukelele and she sang a cover of Blondie’s “Dreaming”. It was great. I do wish that the concert had been at a different venue though, and not just because it’s a trek from Baltimore to Alexandria, VA where The Birchmere is. It was my first time at the Birchmere and I don’t really have much reason to want to go back. It’s a seated venue, but it’s not theatre style. Instead there are rows of 6 person tables that you sit at and can order food and drink though you are not required to. We ordered dinner, which though it was a little on the expensive side was actually much better than I was anticipating. The chairs were very uncomfortable though and there wasn’t much space between tables or chairs so I felt very crammed in. The tables on the sides where we were sitting are situated such that one half of the people at the table have to sit with their backs to the stage or crane awkwardly around to watch the concert, which seems awful. Luckily we both got chairs facing the stage. By the time we were done with dinner and the show was ready to start I was already extremely uncomfortable and so didn’t enjoy the show as much as I might have because I spent the entirety of it thinking about how much I wanted to get out of that chair. Additionally it’s the type of music that lends itself to moving and dancing around, so it was very strange to be stuck sitting at a table. You couldn’t really stand up even if you wanted to because there was no room and even the few people seated on aisles who tried were told to sit down by the staff because they were blocking the view for other people. Baltimore Soundstage has a very similar set up. I’m pretty sure they bought their tables and chairs from the same people because it was literally the same awful black chairs in both venues. I felt the same way about The Birchmere as I felt about that, which was that I didn’t like it. Maybe if I managed to see a subdued act where you’re inclined to be seated it might be better, but both times I’ve been to these places I’ve seen acts that are very vibrant and demand to be danced to. Both acts seemed flummoxed by the fact that they were playing and people were just sitting in their seats staring at them. Definitely not my choice for a good place to see a concert. It would take someone really special for me to drive all the way back to The Birchmere again. I was intrigued by the audience that was at this show though. Imelda May is 40 years old and yet the majority of people there were people my parents age or older. There was a lot of gray hair there. There were also a fair number of families with children, which is not something I’m used to seeing at most of the concerts I attend. I’m a big fan of kids at appropriate venues, which I would say The Birchmere is one, because I’m all for passing the love of live music on to the next generation. I totally expected the audience to be full of hipster type people, and though there were a couple of those that was not really at all who it was composed of. Overall it was a good show at a less than ideal place. Hopefully my husband enjoyed it, since there was a long build up to him wanting to go to a concert.